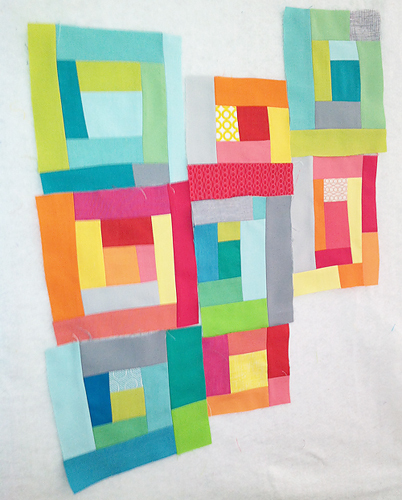 Next month I'm lucky enough to be leading a sewing workshop at the Cincinnati Modern Quilt Guild. I grew up in Cincinnati and my family all still lives there, so this will be a really fun opportunity for me to hang out with all the talented modern quilters in my hometown. The guild was really great and left the decision as to what we would be working on up to me. 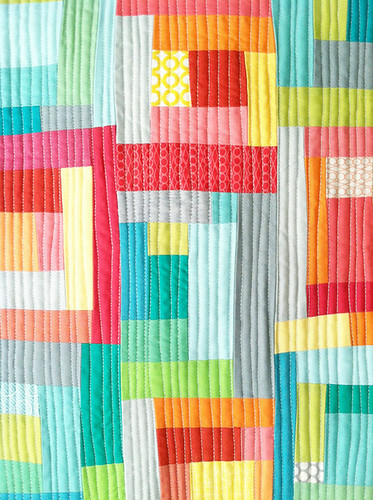 I love improvisational quilting so I thought that would be a fun technique for everyone to explore. This is our class sample ~ improvisational log cabins. 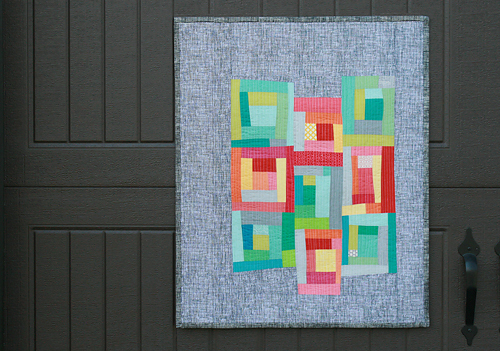 These blocks are a bit similar to the pillow I made Jennifer last October. You can see the work in progress below. I broke down the log cabins by warm and cool colors, incorporating a bit of grey and just a small amount of prints. The border is a black and white Alexander Henry crosshatch. 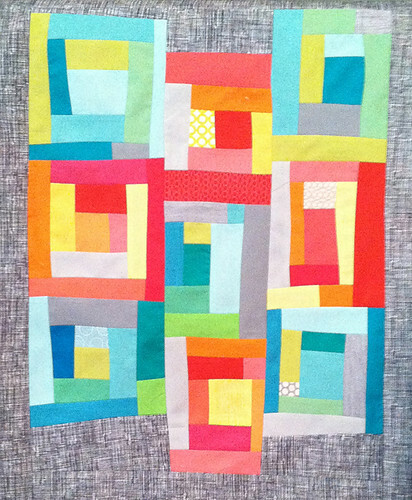 I quilted this mini quilt with randomly spaced organic lines. They are all around 1/4" apart, but I didn't mark or measure. 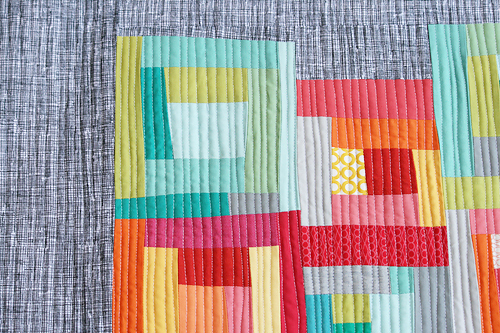 I used my walking foot and slowly moved the fabric back and forth ever so slightly as I quilted. 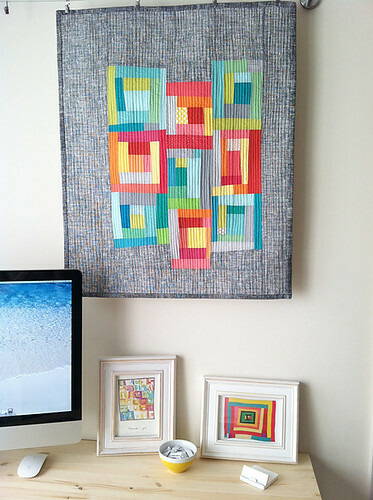 This new quilt has a home above my new computer workstation in my sewing space! 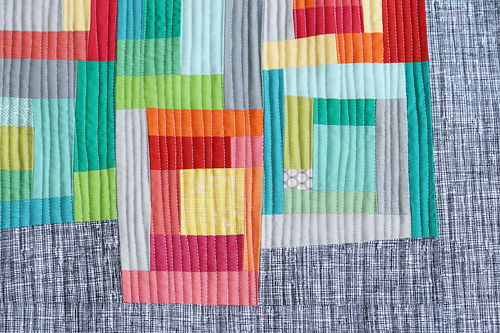 For more information about the Cincinnati Modern Quilt Guild, you can contact them through their blog or email them at cincinnatimodernquiltguild (at) gmail.com.